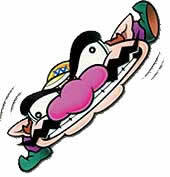 Flat Wario is one of Wario's many transformations in the Wario Land game series. If crushed by a falling weight in Wario Land 2-4, Wario is squashed flat, shortening his jump and drastically affecting his speed. However, he can glide smoothly in the air to reach places previously unattainable, and slip through tiny cracks in walls. Certain machines and enemies will return Wario to his original shape, as well as getting wet. In Wario Land 4, Wario must be crushed by a Compressor in order to transform, and a Decompressor will transform him back into his normal self. Flat Wario can also fall in water to transform him back into his normal self. Flat Wario gets referenced in WarioWare: Touched! at the end of the game. At the end of Wario-Man's cutscene, the guru that Wario stole the DS from is mad from before, so he whacks him on the head with his cane. As a result, he turns into Flat Wario. In Wario Land: Shake It!, Wario can be flattened by large objects (such as blocks) that fall on him. However, it possesses no actual importance to the gameplay. A possible reference to this form of Wario can be found in Mario Golf: Toadstool Tour. In one of his failure animations, Wario holds a huge boulder over his head and tosses it into the air in rage. The boulder eventually comes down again and hits him in the head, flattening him in the process. He then proceeds to walk off to the right of the screen in a manner similar to Flat Wario. Flat Wario's sprite in Wario Land II and Wario Land 3 has black shoes and Flat Wario's sprite in Wario Land 4 has purple shoes, while in the artwork and in the Japanese commercial of Wario Land 4, Flat Wario has green shoes and his hat is seen. Though there are no reactions in Wario World, the boss DinoMighty as well as many other monsters and obstacles can smash Wario into the ground and flatten him but this otherwise serves so Wario takes damage and is no way useful. ↑ Wario Land 4 European instruction booklet, page 101. ↑ Wario Land 4 European instruction booklet, page 61. ↑ Wario Land 4 European instruction booklet, page 41. ↑ Wario Land 4 European instruction booklet, page 121. This page was last edited on April 12, 2019, at 13:03.